Human LOXL2, Fc Tag (LO2-H525x) is expressed from human 293 cells (HEK293). It contains AA Gln 26 - Gln 774 (Accession # NP_002309). The protein has a calculated MW of 111.6 kDa. As a result of Glycosylation, the protein migrates as 120-130 kDa under reducing (R) condition, and 200-240 kDa under non-reducing (NR) condition (SDS-PAGE). >75% as determined by SDS-PAGE. 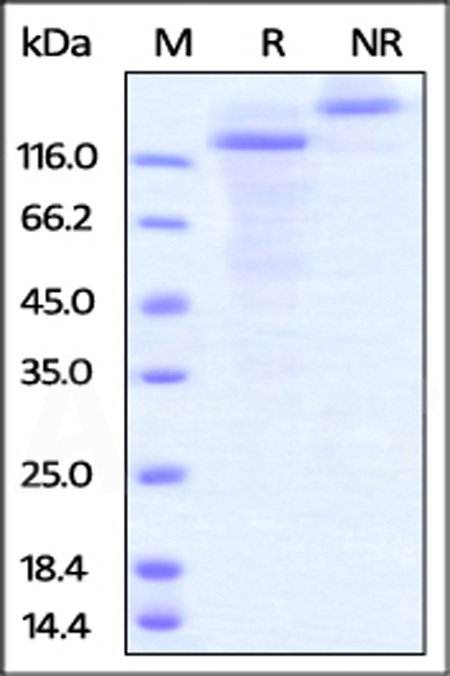 Human LOXL2, Fc Tag on SDS-PAGE under reducing (R) and non-reducing (NR) conditions. The gel was stained overnight with Coomassie Blue. The purity of the protein is greater than 75%. Lysyl oxidase homolog 2 is also known as LOXL2, Lysyl oxidase-like protein 2, which is expressed in many tissues, highest expression in reproductive tissues, placenta, uterus and prostate, Up-regulated in a number of cancers cells and tissues. LOXL2 mediates the post-translational oxidative deamination of lysine residues on target proteins leading to the formation of deaminated lysine (allysine). When secreted in extracellular matrix, promotes cross-linking of extracellular matrix proteins by mediating oxidative deamination of peptidyl lysine residues in precursors to fibrous collagen and elastin. LOXL2 acts as a regulator of sprouting angiogenesis, probably via collagen IV scaffolding. When nuclear, acts as a transcription corepressor and specifically mediates deamination of trimethylated 'Lys-4' of histone H3 (H3K4me3), a specific tag for epigenetic transcriptional activation. LOXL2 acts as a regulator of chondrocyte differentiation, probably by regulating expression of factors that control chondrocyte differentiation. (1) Ota T.,we al.,2004, Nat. Genet. 36:40-45. (2) Jourdan-Le Saux C.,et al., 1999, J. Biol. Chem. 274:12939-12944. (3) Lugassy J.,et al., 2012, J. Biol. Chem. 287:3541-3549.